1. Almonds. Sprinkled almond slices over your morning oatmeal or afternoon salad. The will give you a protein boost and infuse your body with vitamin E, calcium, magnesium, and a healthy dose of healthy fats, says Huffington Post. 2. Pistachios. No, pistachio ice cream does not count here! Peel and pop these green nuts to lower your bad LDL cholesterol. Huffington Post reports they are also rich in fiber, protein, and healthy fats, as well as minerals like phosphorus, copper, and manganese. 3. Cashews. If you're feeling down, try a handful of cashews. Chris Beat Cancer explains the nut has more tryptophan than the prescription antidepressant Prozac. According to The Health Wyze Report tryptophan (yes, the same amino acid in turkey that makes you sleepy on Thanksgiving) helps the body regulate serotonin and produce lactic acid, both of which effect mood. Additionally, cashews are rich in heart-healthy oleic acid, copper, magnesium, zinc, iron, and biotin. 4. Walnuts. This hearty nut contains a cancer-fighting antioxidant known as ellagic acid, explains Chris Beat Cancer. Walnuts also contains elements that strengthen the heart and brain. 5. Pecans. Eat pecans for a healthy dose of B vitamins, vitamins E and A, folic acid, and a wide array of minerals, including calcium and zinc. Chris Beat Cancer says the nutritional profile of pecans make them useful in the fight against high cholesterol. 6. Sunflower seeds. Do sunflower seeds remind you of childhood baseball games? Get nostalgic, it could be good for your health. According to Huffington Post, sunflower seeds are a good source of fiber and protein and are rich in vitamins E and C.
7. Pumpkin seeds. When making pumpkin pie in the fall, take care not to toss pumpkin seeds. They give your immune system a boost and fill your body with healthy omega-3 fatty acids and zinc, says Chris Beat Cancer. 8. Sesame seeds. Tonight, make Wolfgang Puck's sesame crusted salmon, courtesy of ABC News. According to Chris Beat Cancer, sesame seeds lower blood pressure and protect against liver damage. They're also thought to prevent asthma, migraine, osteoporosis, and painful PMS symptoms. 9. Flaxseeds. According to Huffington Post, flaxseeds are an excellent source of omega-3 fatty acids. Just two tablespoons offer a full five grams of fiber and a treasure trove of B vitamins. In addition, flaxseeds contain plant lignans, which are thought to prevent certain types of cancer and diabetes. 10. Chia seeds. If you have trouble getting enough fiber, try adding chia seeds to your diet. Just one ounce contains 10 grams of fiber, says Breaking Muscle. With five grams of protein and just 9 grams of fat, chia seeds are an excellent way to start your day. Try this chia seed pudding recipe from Oh She Glows, for starters. 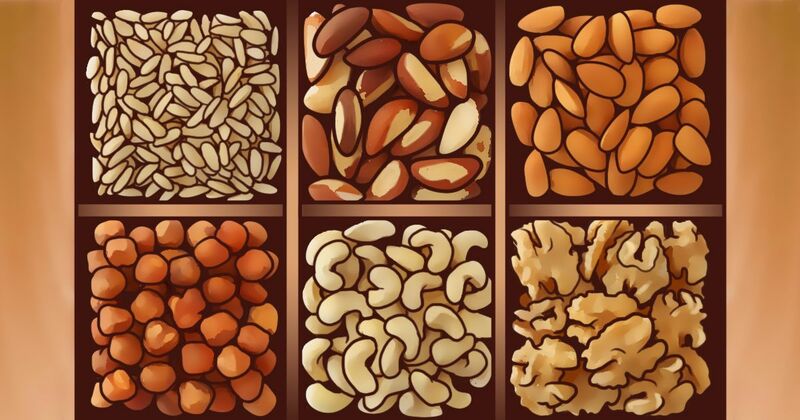 Tell your friends and family about the many wonderful benefits of nuts and seeds when you SHARE this article on social media!